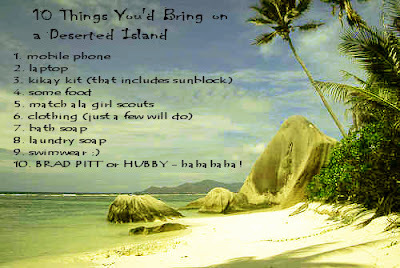 Brad Pitt in a deserted island trumps hubby big time! On second thought, we can't force Brad to build a shelter or find food for us but our hubbies will do it without questions. i should have included my wentworth miller since you'd be bringing brad pitt, we can have a party there. hehehe... happy tuesday! Great list! I love the Brad Pitt part! Hahahaha...love it. Your husband or Brad, it's all good. Great list! Well, if I could have a fantasy deserted island, I'd bring Sean Connery. Have a great day! LOL! I much rather bring my Prince. He's got looks and he's a genius! Theres a lot of people taking electronics. Wouldn't you want to be disconnected from the world? Oh... Mr. Pitt, I'm sure I could put him to good use! Great list.